Join the low cost fitness revolution! "I opened the first ever F4L club in Tallaght in the Republic of Ireland and I must say that I was delighted with the support and assistance I got from énergie. 18 months on and I understand the benefit of becoming a franchisee. I have a profitable club with over 1500 members." 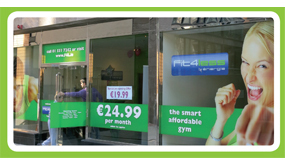 Fit4less is the market-leading budget gym for everybody. Our members enjoy first-class fitness facilities with state-of-the art equipment from as little as €24.99 a month. With Fit4less franchisees enjoying spectacular success, consistently exceeding their business plan targets and remaining profitability in record time, this is the franchise that is taking the market by storm. Fully supported by the énergie group, the UK’s leading fitness franchisor; you’ll have the best possible team in your corner every step of the way.